Southern students walking into the Engleman Rotunda last week were greeted by an unusual sight. A few steps into the building, Mary Patricia Lamberti, an assistant professor in the department of nursing stood at attention in a medical uniform. Lamberti was calling students forward to the table besides her, where nursing majors were lining students up to have their blood pressure taken. Stations were positioned throughout campus at the Adanti Student Center, Engleman Hall, Davis Hall and the Wintergreen Building to spread awareness for The Great American Smokeout. The Great American Smokeout is an event sponsored by the American Cancer Society, on every third Thursday of November to give people a chance to quit smoking. Lamberti’s station in particular focused on the connection between smoking and high blood pressure. The students working for her reported the recipient’s blood pressure and told them health status of the reading. “A good blood pressure is in the 120 to 180 range, under that is considered normal but people who smoke can have blood pressures that are five to ten millimeters of mercury higher, so in the 130 over 190 range,” said Lamberti. A particular issue her nursing students ran into was the amount of high blood they recorded from the incoming students. 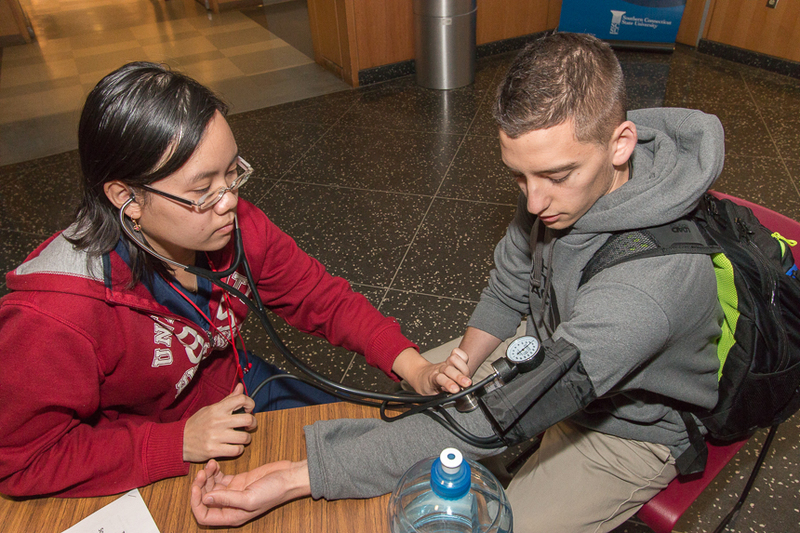 “I’ve had the nursing students practicing blood pressures and they have been surprised at how many people have higher blood pressure,” said Lamberti. The professor provided some recommendations to the students that read at higher level. For Alyssa Kagley, junior public health major at Southern, The Great American Smokeout is a personal event. Kagley volunteered through health services to work the stand in the Adanti Student Center which provided the health facts associated with smoking. The Great American Smokeout coincided with Southern’s decision to make the campus smoke free. Several stations included petitions for students to sign that would decide whether the university would consider having no tobacco of any form allowed on campus. “We are trying to take the campus to become a tobacco free campus end of spring semester 2015, we are trying to encourage students to go online, take our survey and we are trying to get a feel about what they think about going tobacco free,” said Kayla Harris a Secretary at Health Services. The issue of students of legal ages right to smoke tobacco on campus was brought up at the stands, inferring that smoke ban will take away all smoking zones.